IPsec 可以應用在兩個端點的主機,主機可已是 desktop 或是 serverc.主要透過 IPsec 可以增強兩端點的機台的安全性.這兩台機台都需要安裝 IKE( IPsec 的套件名稱為 Internet Key Exchange,套件名稱為 ipsec-tools) ,做相同的設定,他可以應用在 Private 或是 Public 的網路環境下. 透過 RHEL5 提供的 GUI 工具 #system-config-network (從 RHEL 6 開始網卡設定工具程式改為 "NetworkManager Applet) 來設定 VPN 是相當簡單的工作.在 System / Administrator / Network 一樣可以找到. 在 IPsec分頁, 選擇新增 "New" 以啟動 IPIPsec 設定精靈. 按 Forward 可使進行 a host-to-host IPsec 連線設定. 選擇連線名稱,該名稱會成為相同對應的設定檔名,我這邊的命名為 ipsec0.建議點選 "Activate connection when the computer starts".按 Forward 繼續下一步. 選擇這一次我們要使用的 Host to Host encryption 按 Forward 繼續下一步. 第一次使用建議使用 "Automatic encryption mode selection via IKA",熟悉後面的設定檔之後可以使用 manual 來設定,按 Forward 繼續下一步. 在 Authentication key 頁面點擊 Generate ,輸入一串密碼,回到 Authentication 會看到一串亂碼,該亂碼是剛剛輸入的 Key 透過 one way hash 所產生的.按 Forward 繼續下一步. Summary 可以看到剛剛所設定的值,點擊 Apply 回到 Network Configuration 在 File > Save 將設定保存下來. 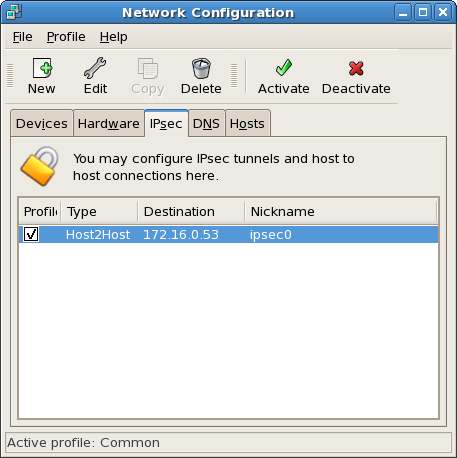 在 Network configuration 去 Activate 該 IPsec. IPsec 相關設定檔這些檔案都是在 network configuration 的 IPsec 精靈所產生的. IPsec 有沒有正常在運作,我們可以透過 netstat 來觀察目前網路連線狀態,我們只要觀察 IPsec 所使用的 UDP 埠 500 即可.